Below is an approximation of the talk I gave at my CCCC panel in Tampa last week, called “Meaning Is In the Making: Three Responses to Shipka & Her Response”. You can view the slidedeck here. Special thanks for co-panelists Frank Farmer and Kristi Prins, and an extra special thanks to our respondent, Jody Shipka. 4Cs is a annual reminder that the most intriguing aspects of Jody’s work can be gleaned from her own composing practices, where she makes meaning by experimenting with [slides 3-6] forgotten technologies and alternative archives, purchased through dedicated Saturday afternoon visits to Maryland junk shops, flea markets, estate sales, garage sales, and thrift stores which then get reassembled in her house, then edited through film and circulated via social media, journals, workshops, and, of course, national conferences. Her work gives objects a memorable, visceral afterlife through accumulation, curation, resuscitation, and remediation. [slides 7-8] In her Inhabiting Dorothy project, for example, she [planning to ad lib briefly here based on your panel]. In this paper, I’d like to align myself with Jody’s gestures to reuse materials, but apply this as a communicative practice that is more political than has been discussed in her work. In short, Jody has both theorized and demonstrated throughout her work that all communicative practice is multimodal. That is, following Paul Prior and Jason Palmeri, she argues that multimodality is not a genre or a certain kind of text, but a “routine dimension of language in use.” In her essay “Including, but Not Limited to, the Digital” she echoes an emphasis originally laid out in her book, Toward a Composition Made Whole, that multimodality should call our attention to systems of activity that lead to meaning-making. She explains how multimodal production is a “complex and highly distributed process” that accounts for “the role that texts, talk, people, perceptions, semiotic resources, motives, activities, institutions and so on play in the production, reception, circulation, and valuation of” things — whether they are printed texts, digital films, material objects, machines, or other hybrid forms not yet imagined (75). Hence, rather than ask students to respond to assignments with specific, genre-driven products, Jody’s courses emphasize a variety of possible rhetorical and performative multimodal accomplishments — “things” that are not restricted by representational systems that were denied or made available to them by their instructors. Time permits me from fully explicating some of the rich examples from her classroom, but in short, Jody’s students make a wide variety of things — objects like ballet shoes, garbage cans, and shirts [slides 11-13]. In the time I have left, I want to quickly offer a multimodal accomplishment of the public kind by looking at zines — self-made, self-circulated, do-it-yourself print publications that obsess about something, whether that “thing” is punk music, anarchism, bisexuality, Thai food, dishwashing jobs, murder histories, or something else. Before I theorize a bit about the multimodality of zines, I thought I’d illustrate what zines are and what they can do through an example of my own zine, Hotdogz. I’ve been waiting to make a zine about parenting for a while and so I began Hotdogz knowing that Cs would be a useful occasion to connect my complicated experiences with Florida to the state’s broader social history. But instead of beginning with my own writing, I started making issue 1 with “F 319” — the Library of Congress letter and number most relevant to Florida history. Because zines are a visual medium, I found the relevant shelves in our university library and sat and fumbled through the books, pulling titles off the shelf and marking intriguing passages and pictures [slides 18-22], which I then scanned using one of dozens of photocopy machines in the library. Meanwhile, I gathered family images from my computer files and Flickr account. Knowing that I would eventually make photocopies of my zine, I used Photoshop to adjust my images from color to halftone black and white [slides 23-31]. In between these processes, I read a few chapters from the edited collection, The History of Florida and took notes on the facts and stories from Floridian history that struck me; I also began to narrate my familial history as simply as possible. I then downloaded and imported a free comic book font into Pages and printed these with my images on my aging laser printer. Similar to Jody’s process for making films and her students’ processes for their projects, zines often take, borrow, and remediate from everyday materials. Mine came from the library and my own photos, but they could have just as easily come from printed matter found in junk shops, garage sales, or through Google Image. However, unlike the multimodal accomplishments articulated in Jody’s examples, the guiding force for making zines isn’t performance or interanimation but circulation; that is, although the epistemologies of our communicative practices are similar in our view of research as a lived process, success for a zine is determined by the rhetor’s ability to anticipate what happens after the prototype is built: how, where, and to whom the zine be distributed. This is facilitated by two critical encounters — one material, one cultural — that influence the goals and choices made in the production process: the copy machine and the stranger. For example, in terms of materiality, not only did the copy machine dictate how my images would reproduce, but [slide 36] I chose to make my zine a fourth of the size of a letter sized sheet of paper since I could make 50 copies of a 24-page zine using only 150 sheets of doubled-sided paper. In other words, I could reach more people with less resources if I worked with less space. I then spent 3 late hours in my department’s copy room, printing, collating, cutting, folding, and stapling issue 1. And, of course, as a cultural encounter, Cs provided me with the temporal and spatial occasion to circulate a zine to you, strangers, all of whom will judge me on the appropriateness of the occasion, my awareness of kairos. In their book The Available Means of Persuasion Sheridan, Ridolfo, and Michel suggest that “kairotic inventiveness” plays an essential role in public rhetoric since it not only requires an understanding of how composition anticipates circulation, but also how kairotic determinants — time, space, channels — are often beyond the rhetor’s control. This has particular importance for public pedagogies that make use of multimodal forms as the material and cultural contexts of those forms limit the available means for production and circulation. As Sheridan, Ridolfo, and Michel put it, “rhetorical theory has yet to confront the full implications of taking circulation into account” (61) realizing that it is at least partially “constitutive of rhetorical composition” (67; emphasis in original); this gap in our theory is reflected in our multimodal pedagogies. For example, when I ask students to make zines in my undergraduate classes they fully immerse themselves in the production process — [slides 40-43] cutting and pasting covers from old copies of Seventeen, remediating their nonfiction through comics or handwriting and type, scanning old children’s books from the library to use as backgrounds, and even sprinkling glitter throughout. But sometimes when I remind them that the photocopy is what’s really important for zines, they seem a bit disappointed. For some of them who are used to the ethos of professional magazines, black and white just isn’t what they envisioned; if they want a color cover or stitched binding, for instance, they have to find a way to reproduce that effect 20, 30, or even 50 times. Some students do vouch for color copies, but even then they have to significantly reduce their print runs if they want to stay within a reasonable budget. The printed copy is the reality that part of circulating one’s work means loosing control — that it means coming to terms with kairotic determinants that bring rhetorical agency in sharp relief. They learn that to publish is ultimately to commodify writing and that the available means of production and mediation are based on their own resourcefulness and capital. While it is true that Facebook posts, retweets, blog entries, and wiki edits constitute other ways in which students engage textual reproduction (and they do this for me too), new media can sometimes obscure the material aspects of circulation. I can create a blog in no time, but who will read it? When it comes to distribution, zines don’t work through bots or analytics. They are either seen or they’re not. 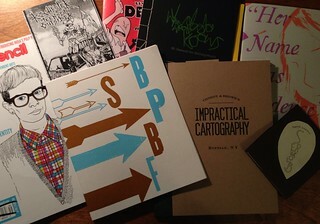 Hence, putting all those copies to public use is part of the multimodal work of zines. For this reason, I’ve pushed students to organize, curate, and publicize zine festivals hosted on campus where they can distributed copies of their work to strangers. On Tuesday, for instance, my students made the decision to [not sure what they decided yet — put I was pushing for a public festival like my Spring 2013 students did!]. When my students did this in the Spring 2013, they circulated their work for more than 30 strangers made of writing professors and the friends of their classmates. As Sheridan, Ridolfo, and Michel argue in the introduction to their book, when the field brings multimodality and the public turn together, it can more clearly see the importance of who has — or does not have — the available means of production and mediation. In other words: “who owns culture” (xvi; emphasis in original) becomes a paramount concern. This extends — but also politicizes — Jody’s arguments that multimodal frameworks should be “engineered to underscore the interconnectedness of systems of production, distribution, reception, circulation, and valuation” (77). DIY and zines have historically pushed the politics of this interconnectedness, always aiming to minimize or altogether eliminate “moneypeople” — what Mary Sheridan has dubbed “corporate intermediaries” — from their systems. Although their content isn’t always political, the anticipation of circulation in the material production of zines renders these intermediaries — human and nonhuman agents alike — more clearly. Even as zines limit the available “representational system” to printed objects, the ecology of their multimodality — their original obsessions, their remediated scraps, their changing of hands — are worth exploring, not in spite of the late age of print, but because of it. Note: This is the second of a five-part workshop I am doing for a class on community writing this semester. 1. Reflect on your experience making a mini-zine. Last week you made a mini-zine in about 90 minutes, which allowed you to experience the entire process of zine-making: thinking up an idea, marking pages, making and folding multiple copies, and distributing them all over campus. So I’d like to start today reflecting on both the excitement of that process, but also its challenges. In short, what did you learn from making a mini-zine? And did you see Sara in the Daily Orange today? 2. Know the design-cost ratio. While hardly scientific, DIY bookmaking essentially works on a simple tradeoff principle I’ve called the design-cost ratio. That is, the more you invest in the design of your book or zine, the more costly it will become — either in terms of $, labor, or time. At the same time, the more you invest, the wider your reach and more likely your zine will stand out among others. I think of this, then, in terms of variables. marks — cut & paste (collage, pen & ink, etc. ), digital (typography, images, etc. ), colors, margins, etc. folds — landscape, portrait, middle, accordion, etc. These are just some of the things you need to think about when you decide to make a zine. I’ll introduce you to some of the tools we have available, although it should be obvious that there are many, many more than is represented here. Take the rest of our time together to look at the handout I distributed on the standard 1/2 page zine, the micro mini, and making copy-ready masters. Then start experimenting with prototypes. After 15 minutes or so, I’ll start taking some of you to the copy machine to show you how your prototypes will look when photocopied and in book form. UPDATE (3/31): The Syracuse U student paper, The Daily Orange, ran a story on HappyCUSE on March 31, 2014, including a brief quote by yours truly. I ran this workshop for a 400-level community writing class yesterday and it went pretty well. It took longer than I imagined (about 90 minutes as opposed to the 60 originally allotted), but the variety of mini-zines that came out of this workshop was impressive. I copied their zines while they moved on to another activity with the instructor (this is a 3-hour class) and dropped off the pile of 100 unfolded zines before I left. Most useful to me was to discover yet another way to experiment with experiential circulation, but without dedicating an entire unit or course to DIY or zines. I didn’t say much to the students in terms of what they could(n’t) or should(n’t) write about. I only suggested that if students were stuck, that they could imagine where their zines might be shopdropped; that is, by imagining the possible publics who might read their zines, they could think of the various messages they wanted to circulate. The original plan was to exchange multiple zines in class and work together to shopdrop all 100 zines around campus. The exchange also made it so that if they did have ideal drop sites in mind, they could make them explicit through their content (a zine with a card catalog number on it for example, might suggest placement at the library). Also interesting was the fact that students improvised a range of tools and invention strategies when they were asked to physically make a zine. Some used stats or images they got from their smartphones and copied them with pens; some ran downstairs to grab a newspaper to cut and paste using the scissors and glue stick we brought; others dug in their bags for different sized pens or used ours; and yet others still simply talked through their ideas in groups. Over the last 10 hours, @happyCuse has tweeted over 45 times and gained 62 followers by shopdropping what appears to be at least a dozen zines all over campus. And while I assumed shopdropping was a critical act of dissent, it was interesting to me that @happyCuse circulates what Catherine Chaput would call positive affective energies: “pathways that invite human connectivity and constitute knowledge as an ongoing, creative pursuit” (22). Folks who found the zine must have seen the hashtag and handle because they tweeted back once they’d found the zines. This is the kind of exchange that happens all the time in zine communities, but I didn’t think it could approximated in such a short workshop. Anyway, I’d love to explore this connection further in the future, and think about shopdropping as a teachable, everyday circulatory practice, but for now, I’m simply going to accept the unexpected and look forward to the second workshop next Monday. I’ve posted a lot about using zines in my teaching, but this post is my attempt to pull it together into one space. It’s also my contribution to FutureEd/HASTAC’s upcoming Pedagogy Project. While I’m far from the first teacher to use zines in the classroom, there were many reasons why I wanted to; in short, like other analogue, multimodal projects, the format defamiliarizes materiality and circulation in ways other traditional modes tend to obscure. These assignments occurred in two lower-division writing electives: a pilot called DIY Publishing and a long-standing course called Writing Culture, which teaches various genres and conventions of creative nonfiction. I’ll briefly describe these courses and how I used zines in them (with links to direct interested folks to the original course material), address the sticky issue of assessment, and finally offer some suggestions on why you might consider using them in your own classes. The DIY Publishing course was set up so that students would experience and experiment with various approaches to publishing on their own throughout the course — whether it was through informal print networks or online with WordPress and Twitter. Our work with zines occurred in the first unit as I sought to define and historicize the idea of DIY. Alongside readings about zine histories (including primary sources and oft-cited books like Stephen Duncombe’s Zines: Notes From Underground), students visited the University Library’s Special Collection Research Center, which houses several publications that qualify as DIY: abolitionist newspapers, Dada booklets, Tijuana bibles, various underground newspapers from the Sixties, and hundreds more. With the help of some amazing librarians, students had to pull an item from the Collection, research its history, and teach the class about it during a special session in the library. Specifically, students had to talk about the artifact in terms of its origins, significance, audience, materiality, and circulation. This was meant to serve as a text that would inspire their own zine, leaving them to interpret “inspiration” broadly: it could mimic the artifact in terms of form and/or content, take a more reflexive approach by making a zine about the artifact, re-interpreting the research process, or by doing something else entirely. Meanwhile students also ordered zines from several online outlets, including distros like Sweet Candy or Nieves, online underground bookstores like Atomic Books or Quimbys, or directly from the writers through hubs like Broken Pencil or the POC Zine Project. Once they arrived in their mailboxes students brought them to class for an informal show and tell. We also attended a bookbinding workshop hosted by one a wonderful book-arts scholar at Syracuse named Peter Verheyen. Importantly, the unit culminated in Syracuse’s first-ever zine festival, where students peddled multiple copies of their zines in a rented room in the library. We invited anyone we could via our personal networks on Facebook and Twitter, which produced a pretty good turn out of 30+ strangers. The Special Collections Resource Center also blogged about it. Unlike DIY Publishing, which left the question of content open and admittedly rushed, Writing Culture asked students to respond to more than 35 prompts throughout the semester and in any format they wanted — using MS Word, spiral notebooks, on WordPress. Yet, it required that they produce five copies of a mini-memoir in the form of a zine at the end of the course. Since 35 prompts produced pages and pages of content, students had to read back through their work carefully and look for themes that matched their ambitions for print. Like DIY Publishing, students were introduced to zines gradually: they watched a video about Portland’s Independent Publishing Resource Center, visited the Special Collections to see examples of zines; ordered zines from bookstores, distros, and hubs; and experimented with various ways they might make their own. Our workshops specifically addressed copying, binding, and otherwise differentiating their work with traditional bookmaking practices like stenciling, stamping, stitching, etc. On the final days of class, students performed readings of their zines and asked me to host an exchange, whereby I distributed zines based on certain affinities (which I connected using abstracts they emailed and/or discussed with me). For our event, I dressed up as Santa (it was December) and ceremoniously introduced each student’s zine, essentially gifting them to two other students in the class. At the end of class, students had enough zines left over to informally gift leftovers or to request copies from writers they admired. Think about yourself at the start of this unit/course. What was the extent of your experience or knowledge of zines and DIY print communities at the beginning of the unit? What did you learn about them and how did it apply to your zine? Discuss how you arrived at the the idea for your zine. Was it inspired by the Special Collections Resource Center (SCRC) first or was an initial inspiration nuanced through your research at the SCRC? What goals did you have for this zine and did you meet them? How did your SCRC item influence your choices? Talk about the limitations and choices you made with regard to the materials of your zine and the tools required? What was your vision and how was it compromised by these tool and technologies? Reflect on your experience planning and witnessing the Syracuse Zine Fest. Were you inspired by the reception of your zine in the Spector Room? Disappointed? Discuss the implications of creating your zine with regard to your future as a writer. How did zine’ing support or complicate your goals? What will Issue #2 of your zine look like? How will it build from the lessons of Issue #1? Reassess your grade based on the contract. What did earn and why? As you might suspect, these process documents are a lot to keep track of. It worked well for me, but as graduate TA, I only teach one class per semester. I’m not sure I’d have as much success under a 3/3 or 4/4 load, so that is something to consider. Nevertheless, unlike countless writing instructors at the end of the semester, I didn’t dread reading and responding to student writing; I reveled in it. Folks interested in using zines in their classes would do well to spend a few minutes reading the Broken Pencil article as Gibb explores some of its other perils: potentially co-opting an often misunderstood underground ethos, forcing students to disclose personal information, or misrepresenting the histories of zine or DIY culture. On the other hand, print gets a bad rap in many circles these days. Aside from privileging alphabetic and/or academic literacies, the arguments go, teaching the conventions of print do not seem as relevant as asking students to engage inherently collaborative, digital spaces. Yet print has its affordances too. As anyone who’s asked students to exchange papers in class knows, print is tactile, cheap, portable, immediately exchangeable, and often designed for reuse. It’s an intimate, one-way medium whose arrangement and distribution is inherently personal and tactical. Print and its potential for preciousness, is also is able to document a writer’s thoughts, identity, or history more permanently — as any archivist will tell you — than most digital formats. When students work with print, they recognize this preciousness and they feel a certain ownership and pride that simply doesn’t occur with the traditional term paper or even their own blogs (though, as Cathy Davidson reminds us, they do often write more with the latter). I still teach both formats, of course, but the zine is an intriguing multimodal approach offering affordances these other traditional venues cannot. I feel like I’ve mismanaged my very limited professional time these last few weeks, spending too many hours planning and responding to writing in my creative nonfiction course while reading two books on my exam list too closely. For anyone out there who’s ABD, I imagine this is a familiar story: without the weekly exigence of coursework or a scheduled exam, it’s easy to put other tasks in front of it — or to try to understand everything as deeply as possible or to get the writing just right. My saving grace, though, is that two conference proposals I wrote on zines this summer were accepted to both CCCC and RSA, so I do have more granulated goals to work toward as the semester develops and I’m hoping these papers will lead to chapters of the dissertation and/or publishable articles. The paper for CCCC concerns something I’ve dubbed pedagogies of experiential circulation — the notion that students can distribute their work materially by doing it instead of simply learning about it. My example comes from students from my DIY Publishing class who distributed their zines at their self-organized zine fest last spring — Syracuse’s first. It was one of the best teaching experiences I’ve had, as students shared some very personal, risky work — both in terms of content and form — publicly. Importantly, we didn’t judge their “success” with this event based on traditional rubrics of rhetoric. Thus, in my presentation, I hope to reel in some of the loftier goals that pedagogies that take up rhetorical delivery/circulation/distribution typically engender — namely the idea that we measure rhetorical success on whether a student is able to observably change someone or something in their locale. Of course this begs the question, if rhetorical success cannot be measured by some sort of material, observable change, how can it be measured? Originally I proposed that a re-articulation of agency — as a more emergent phenomenon — might help reconsider this question and I still think that move is helpful. That said, Frank Farmer’s new book, After the Public Turn: Composition, Counterpublics, and the Citizen Bricoleur (2013), considers how in certain communities, like zines, remaking is the assumed the rhetorical goal — of inspiring and influencing others to also remake or to become what he dubs a citizen bricoleur, “an intellectual activist of the unsung sort, thoroughly committed to, and implicated in, the task of understanding how publics are made, unmade, remade, and better made, often from little more than the discarded scraps of earlier attempts — constructions that, for whatever reason, are no longer legitimate or serviceable” (36). Importantly for public sphere theory, bricolage is figured as multimodal (my words, not Farmer’s), an expressive aspect of communication that resists the traditional notion of public discourse as “rational-critical debate.” As an assemblage of modes, bricolage and other expressive forms of discourse help to form counterpublics, or cultural publics, as Farmer calls them. An important aspect of zines, of course, is their materiality, which in the case of anarcho-punk zines, literally arises out of any remnants of fast-capital print. Farmer focuses more on composition than distribution with his argument, but his attention to the rhetorical goals of DIY communities and his discussion of zine’s materiality in light of digital distribution channels has important ramifications for teaching circulation. For example, at one moment in the book, Farmer considers counterpublics as “widening gyres” — a term that gets at the paradox of circularity and mutation of social movement discourses. I have previously discussed these as ecologies or fluxes (to borrow from Edbauer), so I’m curious if there might be key differences in the language we use to describe these phenomena and how those differences might affect a methodology that is concerned with the movement of rhetoric. Nevertheless, the idea in introducing these terms to come to terms with the complexity and vastness of circulatory systems so as to almost render ridiculous the idea of agency at the individual level, which is why considering its definition is appealing to me. It’s also appealing because of embodied and imaginative versions of agency associated with the idea of DIY, which Farmer takes up in the book. Specifically he considers the relationship between DIY practices and ethos and materiality. Obviously materiality is used to differentiate zines from other self-publishing venues on the web. Zines offer intimacy to certain communities, and as ephemera offer traces of its histories, leading Farmer to wonder if a DIY ethos can even exist on the web. This question is important if as Warner and Farmer argue, counterpublics exist as ways of being, not simply as deliberative discourses. As Kristin Arola has written, for example, certain forms of digital writing use templates that feature content — and take away from issues of design. Unless one knows how to code, options for form are limited. Moreover, what gets made in addition to the zine, is an important difference between print and digital self-publishing platforms. The materiality of zines also embodies an important opposition to media conglomeration. Borrowing from Tim Wu’s Master Switch, who argues that info tech is moving into increasing closed patterns — into a “master switch” — Farmer argues that zines show “what a publication looks like when you do not have free access to corporate-owned resources” (80). Farmer also notes how the surveilling features of the net might also sustain zine communities farther into the 21st century. What seems interesting, then, is that while a DIY ethos might be unique to the composition of zines, it’s difficult to imagine that most zine makers are willing to forgo the internet entirely when its such a practical option for distribution. This has me going back to Trimbur’s work on circulation, as he uses Marx’s definition of commodity (as the contradiction that exists between use and exchange value) to complicate the production/distribution divide. I hope to blog about that complex article soon and rev some momentum back in to the blog this week.